“Green” is a bit of a theme this year and solar chargers have started appearing in a variety of shapes and sizes. the Kinesis K2 takes the concept further by adding a wind turbine for additional generating power. On the plus side it needs extremely little wind to spin, on the downside it adds a fair bit of size to the charger and is less efficient than solar. Still, power is power and if you really need to juice up the iPod out in the boonies after the sun goes down (or you live in the UK and never see any sun) you don’t have many other options at the moment. This thing is so cool cant wait to get one!! I’ve heard there’s a new one out that’s more durable called the K3 and can also be charged through the wall. All the adapters are stored inside the device so all you need to do is carry around this one piece. SWEET! 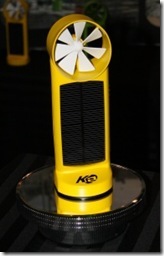 The new version of the K2 is the K3, which is a tribrid – you can charge it with sun, wind or through the wall plug. It’s been upgraded from the CES and has a bigger internal battery and bigger wind turbine. More info at company website http://www.kinesisindustries.com.